With her pageant and performing days behind her, Michelle Tolson, 41, is now putting herself in the public eye once more — as an advocate in the fight against multiple sclerosis. She was diagnosed with the disease last year. 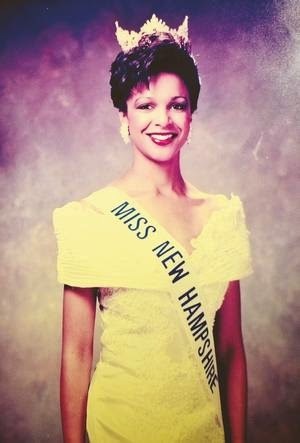 Tolson, who attended Manchester Memorial High School, was crowned Miss New Hampshire in 1996 and went on to compete in the Miss America pageant, where her talent was tap-dancing. A year later, she put her dancing skills to the ultimate test and auditioned for the world-famous Rockettes dancing troupe at Radio City Music Hall in New York City. “I made it on my first try, which is not usual,” Tolson said. She was a member of the Rockettes from 1997 to 2003, and continued teaching dance in New Hampshire until 2000, when she moved to New Jersey. Tolson also worked as a college professor and coached up-and-coming pageant contestants during her time as a Rockette. Tolson lives in New York City and works in public relations for Saxon/Hart, a marketing firm that specialized in working with nonprofit organizations, and she continues to teach dance. She also sits on the board of directors for the Rockette Alumnae. Amid her busy schedule, Tolson said, she started to notice issues with her health. In January 2014, Tolson started experiencing blurred vision in her left eye. Initially, she chalked it up to needing a change to her glasses prescription. After her ophthalmologist failed to find a problem, Tolson’s doctor sent her to a specialist to be tested for glaucoma or cataracts. When the specialist also didn’t find an issue, the doctor sent Tolson for an MRI of her optic nerve. “I got a call in February, on a Friday night at 5 o’clock, saying, ’We think you might have MS,’” Tolson said. Her MRI showed lesions in her brain, a telltale sign of the disease. She also learned that a blurry eye is a common first indicator of MS.
After further testing, on St. Patrick’s Day of 2014, Tolson’s neurologist, Dr. Lana Zhovtis of the New York University MS Care Center, confirmed that Tolson had relapsing-remitting multiple sclerosis. “And then she dropped the bomb: ’And I think you’ve had it 10 years,’” Tolson said, based on the amount of lesions and scar tissue she had. Zhovtis said that Tolson’s disease had likely stayed at bay for so long due to her active lifestyle. Despite this, the diagnosis was a blow for Tolson and her husband, TJ Hadley. Tolson’s first course of treatment was a common MS drug that is generally effective at combating the disease. However, six months after being diagnosed, an MRI showed new lesions, which meant the drug was not working. Tolson began infusion therapy. At a follow-up appointment last month, she said, her MRI showed no new lesions. Zhovtis told Tolson that the infusion therapy should prevent her MS from progressing. While she has started experiencing fatigue, Tolson said she hasn’t had any major side effects from her MS. And she’s using her good health to be an advocate for research. Zhovtis reached out to the National MS Society to tell them about Tolson, believing she would be a great advocate because of her status as a former Miss New Hampshire Scholarship Pageant winner and Rockette. Tolson, who did the walk with a group from her dance studio in New Jersey, said she was inspired by the other MS patients she walked with who were diagnosed years ago. Tolson’s husband has also taken an active role in advocating for MS, serving as her “PR person,” she said. As for continuing her advocacy, Tolson said she would like to get involved with lobbying for MS research, and continuing to inspire and empower other MS patients. “I finally realized that this is a new part of my personality, a new part of my life,” she said. “It doesn’t change who I am; it just adds a new dimension to who I am. I wanted to embrace it and hopefully offer hope.